You may be wondering, what are the best size trampolines to buy? Some other questions you might be asking are how much they cost, what trampoline sizes are there, and how to buy one? Well, some of these questions are a lot easier to answer than others. The reason it is so hard to specify a best size trampoline to buy is a lot of factors go into buying including the trampoline size you need and your budget. With this guide though, you will be able to figure out the best price to size ratio for your needs and available space, as well as the age of the users. How Big Is a Full Size Trampoline? How Tall is a Trampoline? What Size Trampoline for 13 Year Old and Younger? What Sizes Do Trampolines Come In? So What Is The Best Size For a Trampoline? The first factor to consider when picking the best trampoline for the money based, off your needs, is figuring out the size of trampoline you need. A standard size trampoline may be too big for your yard, or it may be just what you are looking for. You may be wondering, what is a standard trampoline size? Well, a standard trampoline can range from 8 ft to as big as 15 ft. Any bigger then this and you are getting out of the standard range, and any smaller you are getting into more children or exercise trampolines. An, average size trampoline is normally 12 ft. We also have our 12 ft or 15 ft trampoline article to help you out if you are considering these sizes. 8 - 10 Ft Round Trampoline: Perfect for smaller backyards. 12 Ft Round Trampoline: Medium sized trampolines. 14 Ft Round Trampoline or more: More flexibility and for older users. So, how do you figure out what size trampoline to buy? The basic factors are how large is your yard, how many people are going to be jumping on the trampoline, and their age. Once you answer these questions it is pretty easy to find a trampoline that will met those needs. The more people going to be jumping on it means you should buy a larger size trampoline. Large trampolines require more room though, so if your yard is smaller you should buy a smaller standard size trampoline. If your yard is really small you may have to go below the average trampoline size of 12 feet and pick out one that is 10 ft or even 8 feet. Now that you know what size trampoline to buy we can get into trampoline prices. A lot of factors go into trampoline price. The obvious one is size. Large trampolines naturally cost more because there is more material and parts involved. Mentioning parts and material though gets into the next big price factor, and that is quality. When we get to the brand recommendations they are being recommended because they provide quality trampolines for sale. 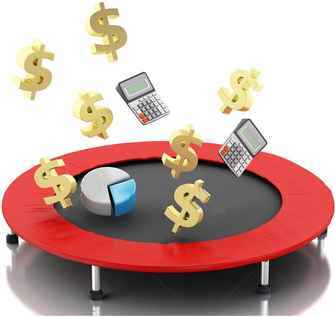 You are better spending more buying a heavy duty trampoline than spending less on one that is not going to last long. One last factor in how much a trampoline cost is technology. The more technology advanced ones cost more, but you get added health benefits like less impact on your joints when landing. You are probably thinking great I know now the factors that go into the cost of a trampoline, but how much is a trampoline and what is the best trampoline to buy? Trampolines cost start at around 200 dollars for an 8 ft outdoor one. Any cheaper than this are either smaller exercise trampolines or not good quality. Your average size trampoline, which is 12 foot, is going to cost around $300 to $400 for a top quality one from a good brand. Getting into the large size trampolines prices climb to over $500 dollars for a 15 ft trampoline. Large trampolines that are outside the standard size range will cost more. 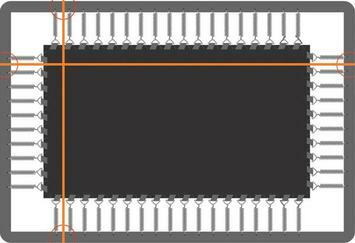 Also, if you want a specialty trampoline like a rectangle or long trampoline then the cost is going to be more. Long trampolines offer great benefits which you can read about in the rectangle trampoline guide, but since they aren’t standard you have to pay more. There are several different sizes of trampolines. But the full size trampolines are the larger outdoor ones. They usually range from 8 ft to 15 ft. 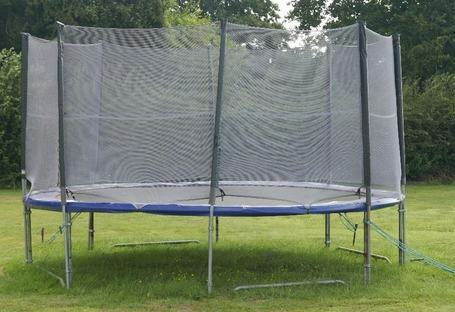 The average full size trampoline is 12 ft. The trampoline height from ground is usually around 2 ft for small 6 to 8 ft trampolines. The height from ground for larger trampolines is around 3 ft. The total trampoline height is around 6 ft for small trampolines and up to 8 ft including the safety enclosure net. According to the Fédération Internationale de Gymnastique, or FIG, the official-size trampoline is 16.5682 feet long, 9.54724 feet wide and 3.78937 feet high. (5m x 3m x 1.15m) The USA Gymnastics also follow this standard size. Most trampoline manufacturers use the size 17 ft x 10 ft for gymnastics trampolines. So now that your question of how much are trampolines has been answered, with even more information then you may have wanted, and also the question of how big are trampolines has been answered we can finally start to address the question of best trampolines to buy. This section should help you determine the best trampoline for the money in the size that you and also with the features you want. To measure your rectangular or square trampoline simply start at the outer metal edge to the other side. Start with the short sides and then measure the long sides the same way. The recommended size trampoline for 3 year old is 36" with handles. ​For 5 year old is 7 ft. The recommended size trampoline for 10 year old is 10ft to 12 ft.
​For 12 year old is above 12 ft.
For 13 year old is above 12 ft.
For gymnastics, we recommend the closest to the Olympic trampoline size that is 10 ft x 17 ft. If your budget or yard is not big enough, get as close as you can. Trampolines come in several different sizes, ranging from small 36" trampoline for kids to very big trampolines up to 17 feet. The small indoor kids trampolines come in 36", 38", 40", 48", 55", 3 feet, and 7 feet. 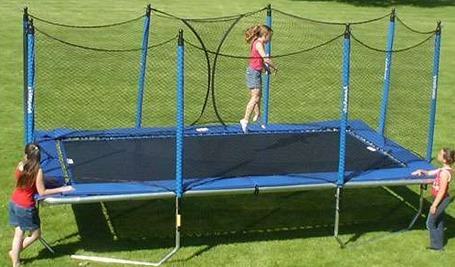 Mini trampoline for adults or mini trampoline rebounders usually come in 32", 36", 38", 40" and 49". Outdoor trampolines usually come in 6ft, 7ft, 8ft, 10ft, 12ft, 14ft, 15ft, 16ft, and 17ft. Some of the best trampoline brands to buy are Skywalker, AlleyOop, JumpSport, Pure Fun, and Ultega Jumper. The reason these brands are mentioned is because they have been in the industry for a while, and are proven to provide quality products. The frames on these trampolines are made of galvanized steel which means that the frames will not rust. The springs are also top quality galvanized steel and provide great bounces. Quality control is good with these brands, so when you buy a trampoline the boxes will contain all the parts. The jump mats and spring covers are also made of top quality material and in most cases is UV resistant to help it last longer and keep its strength. On top of all this these brands provide enclosures to keep your child safe. Skywalker trampolines are great intro trampolines. They offer all the standard trampoline sizes, and the cost is a bit below average compared to others in that size range. This does not mean there quality is not good though. Another cool thing about Skywalker trampolines is you can get a model that comes with a basketball goal, so you can have lots of fun on your trampoline. 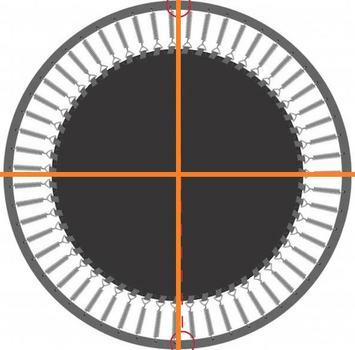 AlleyOop offers the average size trampolines and the price is a little on the higher side. Even though these trampolines cost more they are still worth considering because they have double bounce technology which makes them safer. Also, AlleyOop offers large trampolines and long rectangle trampolines which some of the other brands don’t offer. JumpSport trampolines can be a bit on the higher price side for size, but this is because they have advanced stage bounce technology. This helps soften the bounce on your joints, so if you have joint issues and can afford to pay a bit more than the average for that size it is worth it. JumpSport also makes a lot of trampoline accessories and fitness trampolines, so if you are in the market for those it is a good brand to consider. Pure Fun offers affordable standard size trampolines and there trampoline prices are competitive. You may not be looking for a full size trampoline either, and that is where Pure Fun can really factor in on your buying decision. You may be looking for the best kids trampoline and if that is the case Pure Fun is a great option. 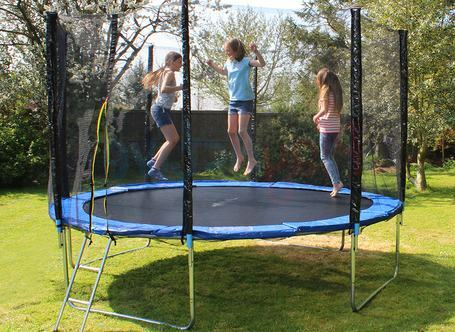 Also, if you are looking for a kids trampoline you can read the guide we have available to help you in your decision. If the above brands cost more than you were hoping than Ultega Jumper may be the right brand for you. They keep the trampoline cost down while still providing top quality. Even though the trampoline prices are lower than others for an average size trampoline Ultega trampolines are still heavy duty. Just remember that it is worth it to pay a little more and get a quality trampoline, than to pay less and have someone get hurt, or have to buy another trampoline sooner than you plan. Sticking to your desired size will help you get the most out of it, so you can feel like that you bought the best size trampoline for your needs. If its a full size trampoline or an average size doesn't matter. Being happy with the purchase and getting the right trampoline size will allow you to have fun for years on your new trampoline.